Main presentation begins at 11:00a.m. Scheduled activities end by 3:00p.m. TO BE SURE IT WILL BE HELD! This Field Day will be held at the farm of Mrs. Merle Wood and her son, Mr. Lance Wood. 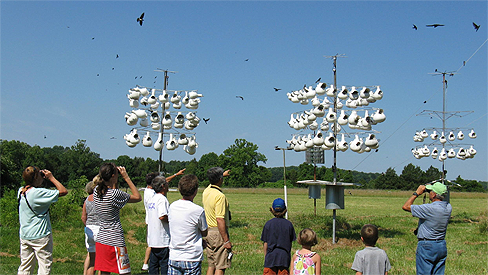 Establishing and maintaining a healthy Purple Martin colony can be difficult; see the most effective techniques and equipment available for successful martin attraction and management, and learn how to increase the size of an existing colony. The Wood family has expanded their colony from four pairs of Purple Martins in 1992 to more than 140 nesting pairs! Protecting martins from snakes, owls, raccoons, House Sparrows, Starlings, wind damage, lightning, etc. 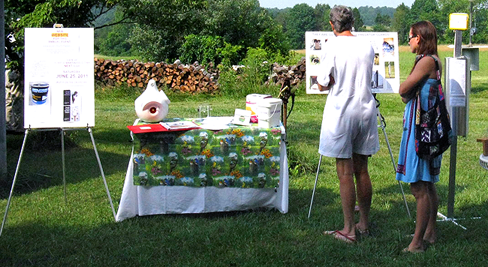 After the main presentations, you can buy gourds/seeds and hear a presentation on how to grow and process natural gourds for Purple Martin nesting. See video of the birds at their gourd nests. Enjoy watching hundreds of these beautiful birds soaring and feeding their young while the instructor teaches! No registration. Event is FREE, but donations will be appreciated to help cover expenses. Bring: Lawn chairs, binoculars, camera, notepad, bag lunch/drink, rain gear, and shoes for walking in wet grass. PLEASE DO NOT BRING PETS. For other bird, wildlife and nature resources visit our links page.